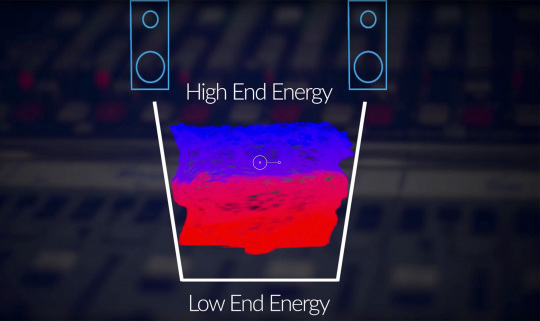 Mastering engineer Brian Lucey talks about "the shape of the V" in this excerpt from his video, "Brian Lucey: Mastering Philosophy and Techniques". What he's referring to is the distribution of low end in the stereo spectrum in a stereo mix. He says that he sometimes EQs the sides to adjust their low end content, presumably using a mid-side EQ or mid-side multi-band compressor. A diagram in the video explains what he means by the “V” (see below). It shows the speakers on the top with the audio energy coming out of them. The highs are at the top next to the speakers and the lows on the bottom. The shape is most "V-like" in pop and dance music, he explains, where elements with a lot of low end (kick, snare, bass, etc.) tend to be focused in the center, and the high sparkly stuff (cymbals, percussion, high-register guitar and synth parts) is panned to the side and helps provide a feeling of width. He says this particular distribution of elements makes for the punchiest sound, but can also tend to make a song sound "overproduced." The shape of the V for pop music, has wide high end and narrow lows. Lucey says that generally speaking, the V is wider at the bottom for rock. He mentions AC/DC's "Back in Black" as an example along with relatively modern rock such as that played by Audioslave. He shows a V that's wider at the bottom for that, which looks about halfway between a V and a U. For rock music, Lucey says that the lows tend to be more out to the sides than in pop. Lucey observes that styles that go for a more "realistic" sound tend to have much more low end on the sides of the image. While a mastering engineer can do some adjusting of the sides of a mix, any significant changes to the shape of the V have to come during the mixing process. For a mix engineer, the panning of the tracks is obviously a crucial piece of the puzzle, and Lucey says it's important to be aware of the impact your mix moves will have on the V.
He also points out that on an album or other multi-song project, the artist and mixer have to think about the consistency of the low end, and thus the V, from song to song. How can you affect the shape of the V for your own songs? A lot of it will be dictated by the musical style and arrangement. If you have a rock song with big fat rhythm guitars panned hard left and right, it will put more mids and lower mids on the outside of the image, thus making the V less sharp. 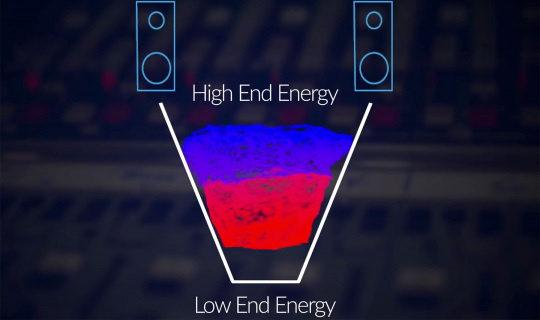 If you've got an electronic track with booming drums and bass in the center and high pitched synths and percussion on the sides, it will mean a sharper V.
Obviously, your mixing decisions will greatly impact the frequency distribution in the stereo image. 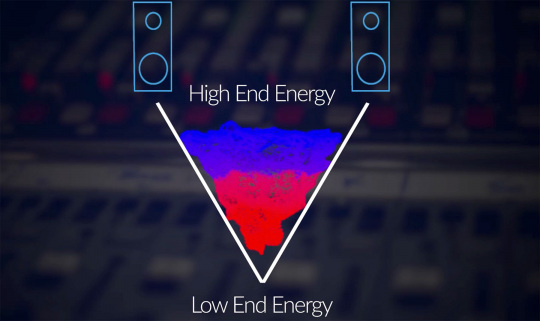 In just about any mix, the kick, bass, snare and lead vocals will be in the center, but your decisions about panning the other elements that contain low frequencies or lower mids—piano for example will affect it, too. Putting such elements on the sides will make your mix less punchy, but possibly more "real" sounding, and less produced, if you want that. Focusing on the mixing stage, let's check out a couple of examples of how panning will impact the shape of the V.
Example 1: This example has a more pronounced V. The bass, drums, low lead guitar, power chord rhythm guitars and low-pitched percussion (congas) are all in or toward the center of the spectrum. The high-pitched rhythm guitar and high-pitched percussion—shaker and tambourine—are out to the sides. 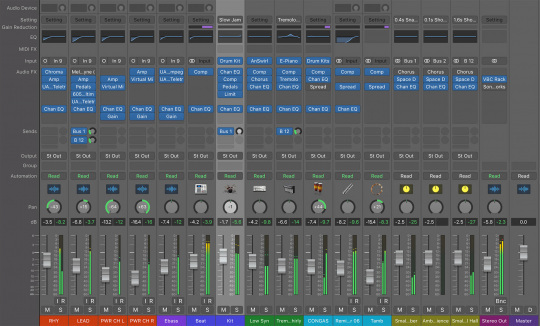 Here's the mixer from Example 1. Notice the panning of the various elements. Example 2: Here's the same piece, but this time, the power chord rhythm guitars have been panned wide, the congas are off to one side and the shaker and tambourine are panned more to the center, as is the high rhythm guitar. The result is a more spread out low end, so the shape of the V is wider at the bottom. 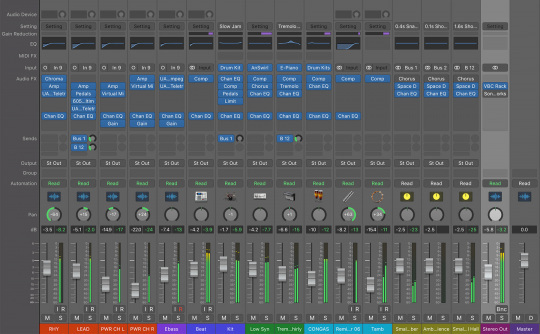 Here's the mixer from Example 2. A big change here is the power chord rhythm guitars moved to the far left and right and the congas moved far to one side.